Both teams made promising starts to their World Cup campaign in what is arguably the most competitive group, and seemed fairly content to settle for a draw in their second game, only looking to edge out their opponent in brief flashes. Jose Pekerman named an unchanged side from the 4-2-3-1 that beat Greece, while Sabri Lamouchi brought Max Gradel into the Ivory Coast line-up in place of Salomon Kalou. Both teams played in broadly the same way, looking to move the ball up the pitch in passing moves down their right side, with the other side wary of being caught out. Their main attacking strategies were trying to catch the other on the counter: Colombia the brighter through the speed of Juan Cuadrado than the Ivorian reliance on a mixed Gervinho performance. The game wasn’t particularly interesting on paper, but the finer details ensured it was on the pitch. 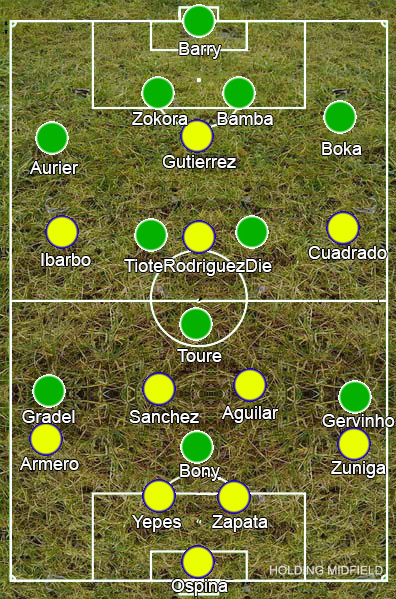 The powerful runs of Yaya Toure through the middle proved a constant threat, Serge Aurier got forward well again on the right and Wilfried Bony justifies his inclusion over Didier Drogba with better link-play, dropping off the front to put the focus on Gervinho, yet Didier Zokora and Souleymane Bamba forever looked like errors waiting to happen. Teo Gutierrez made a hash of a chance but his simple play works well for Colombia, James Rodriguez was quieter than against Greece but still posed problems to the Ivorian midfield and Cuadrado was the game’s stand-out player. The three goals didn’t really follow any pattern of play. Rodriguez opened up the scoring with a brilliant bullet header that should have been defended better and Colombia doubled their lead when Rodriguez caught Serey Die in possession, giving substitute Juan Quintero the opportunity to finish, before the otherwise disappointing Gervinho pulled off a fantastic dribble to smash past David Ospina. It was an entertaining, even game decided by which team had better quality that has all but sealed Colombia’s progression to the second round. The Ivorians are still probably the second best team in this group though, and should still progress at the expense of Japan and Greece.